Welcome to a life changing journey which I promise will give you the tools you have been so eagerly looking for. As your coach for the next few hours and a commitment to be a part of your success journey thereafter, let's get to know each other: Who am I, why this course, and what will this course give you? Every thing has a reason, and you need to know this to realize why the information is so so crucial. 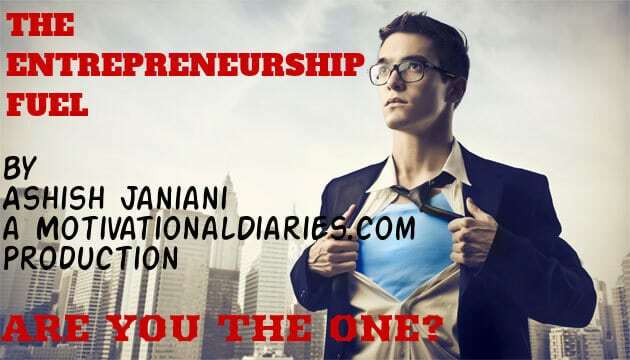 Realizing your dreams via entrepreneurship is a journey of 3 codes your need to unlock. Failingly, majority either don't know the code or have the wrong equation, and thus never realize their dreams ending up by giving in to the toughness you ought to face as an entrepreneur. In this section, I unlock the first ingredient you must possess. Listen carefully and with utmost focus if you are ready to become massively successful! Are you ready to fuel yourself like never before? Two people have massively impacted my life and have an absolute contribution to my success. This section is a MUST zone in moment. Stop everything in your environment, and tune in not only with your ears and eyes, but with your heart. I always say, never listen to a story because you might forget; instead feel it asking yourself "What if this was me?" I promise you, rest of your entrepreneurship journey is about to change. TIME TO ZONE IN! What you went through in the earlier section is a massive moment of growth for sure. But, mistakenly, people stop there thinking it is enough because they have heard it wrong that it is enough; it's not. ABSOLUTELY WRONG INFORMATION! There is one part of the first piece of the puzzle you still need to conquer before we unlock the second door. This section is the REAL SEPARATOR between the hard working & failing, and hard working & succeeding. I, just like many of you, was trapped in to this notion for years and years that the first part of the puzzle is enough (it is truly crucial), but I was so wrong. It hurt me and I felt cheated that all these 'motivational gurus' would stop after sharing the first ingredient and never tell us the whole equation to success. Fortunately, you do not have to suffer because my pain converted into a purpose to help others post I mastered what I am about to share with you in this section. This is a reality check session for you, and until you confess the truth to yourself of where do you really stand with these 4 intelligences, unfortunately, your dreams might just stay that way: DREAMS! It gets really intense as we go through this course and now I am about the unlock the MOST important door to you behind which lies your treasure. People usually say pain is bad, but as you know by now, it's a gift. I say this with utmost conviction because it was pain that lead me to the discovery I am about to share with you. Here is what happened: I do a lot of trainings and because I am absolutely committed to my audience, I have a 99% positive feedback record after more than 500+ trainings and an audience of more than 20,000+ people. There was this pattern of me getting amazing feedbacks with people who were absolutely fueled and now knew exactly how to get there post our trainings; but guess what? 99% of them never really did anything about it post a week! That absolutely frustrated me because I am a committed coach and trainer. I went onto this quest for 6 months to find the answer, and as they say, 'there are no coincidences in life', I finally unlocked the final code, and it changed everything! That is what is about to happen to you right now. This is THE MOST INTENSE section of the entire course! Woohoaa!! You have made it. That's appreciable, but don't breathe yet, I saved a secret gem for those who have made it till here. As I summarize, I give you something I haven't spoken about in the entire course. Finish in style, and I know you & I will meet where the champions celebrate. I will be waiting for you to get here my friend. Cheers and congratulations for having made it!